The MLFI reports economic activity from 25 companies representing a cross section of the $1 trillion equipment finance sector. 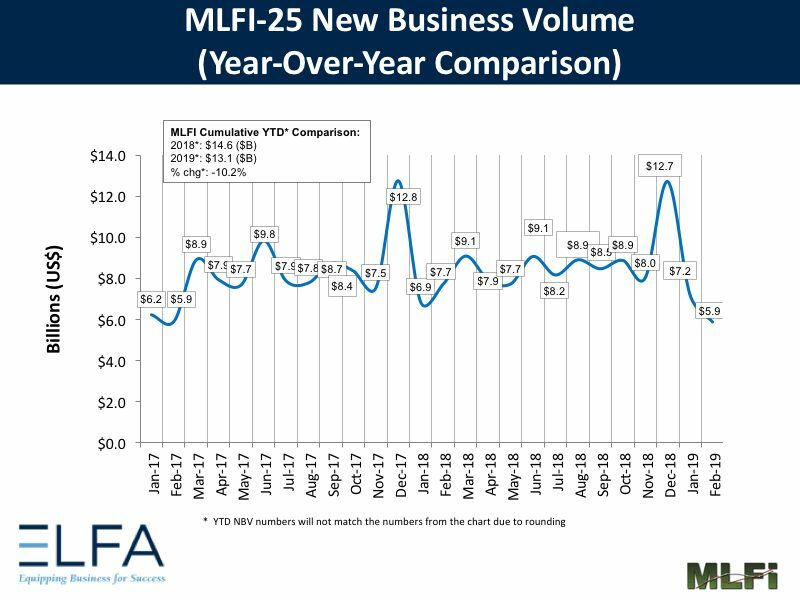 Washington, DC, March 25, 2019—The Equipment Leasing and Finance Association’s (ELFA) Monthly Leasing and Finance Index (MLFI-25), which reports economic activity from 25 companies representing a cross section of the $1 trillion equipment finance sector, showed their overall new business volume for February was $5.9 billion, down 24 percent year-over-year from new business volume in February 2018. Volume was down 18 percent month-to-month from $7.2 billion in January. Year to date, cumulative new business volume was down 10 percent compared to 2018. The MLFI-25 is the only index that reflects capex—the volume of commercial equipment financed in the U.S.—and is released as a complementary economic indicator the day before the U.S. Department of Commerce releases the durable goods report.